Lake Tahoe is a summer sports lover's haven. In one summer day you can do a round of golf in the morning, parasail at noon, and enjoy a jetski tour around the lake at sunset. While winter brings many adventurers to Lake Tahoe for the skiing and boarding, the summer has even more adventure sports to take advantage of: on the water, land, and in the sky. One of the hottest sports in Lake Tahoe is also one of the easiest to learn. Stand Up Paddleboarding consists of standing on a large, surfboard and using a long paddle to push yourself through the water. This type of sport is best done in calm water, but it's a great way to get around the lake and see the views. Companies like South Tahoe Standup Paddle and Kayak Tahoe offer paddleboard rentals as well as guided tours. Kayak Tahoe even has a Paddle School where you can learn to SUP if you are new to the sport. Hot Tip: SUP is a great core and arm workout, and they're easy to transport and launch almost anywhere..
Get a birds-eye view of the lake and the mountains from a hot air balloon. Located in the Tahoe Keys, Lake Tahoe Balloons offers sunrise rides over South Lake Tahoe that launch from a platform in the middle of the water. The one-hour flights rise approximately 10,000 feet above sea level giving you and your family unparalleled views of the Lake and the Sierra Nevada. The cost for a ride is around $300 per person and flights launch from May to October. Hot Tip: A continental breakfast is served on the way to the balloon ride. The entire family will love the adventure of the North Tahoe Adventures Treetop Adventure Park. Various ropes courses and several 800 to 1,000 foot zip lines are available for all ages. Some of the courses are about 40 feet of the ground, but there are several courses for younger children that are only about 8-10 feet off the ground. The park is also available for larger groups and corporate events. Hot Tip: You can design your own adventure at this ropes course, starting at $35 per person. One of the most fun ways to see the lake is by jet ski. Tahoesports in the Tahoe Keys and the Ski Run Marina offers rentals that start at $85 per hour. Each of their jet skis are environmentally friendly, but fast. From their South Shore locations you can be in Emerald Bay in a few minutes. Many of their jet skis fit 2-3 people and can carry supplies and lunch if you want to make a day of it. Hot Tip: Jet Skis are a great way to visit the nooks and crannies and secret shores of the lake. See the lake and the mountains from the backroads. The Camp Richardson Corral has been offering horseback rides since the 1930s and has riding packages on their gentle horses. A 50-minute ride is around $40 and a trail ride is around $80. Most rides take you and your family up into the foothills around Fallen Leaf Lake where you can catch views of Lake Tahoe and South Lake Tahoe. If you want some extra time on the trail, check out their Pack Trips into Desolation Wilderness. Hot Tip: The Corral also offers an easy ride near the lake followed by a western style steak BBQ. Love to run but Boston seems so far away? You'll love this annual October event set up to maximize the Lake Tahoe scenery along the route! Starting in Homewood, it winds along trails and roads through Emerald Bay to South Shore. Aside from a fun, whacky crew of local and visiting participants, you'll love the beautiful views and fresh air along the way. Boston won't do that for you! Hot Tip: Unless you're gung ho to set a record, there are several mini-events set up along the route. Take your time and enjoy! 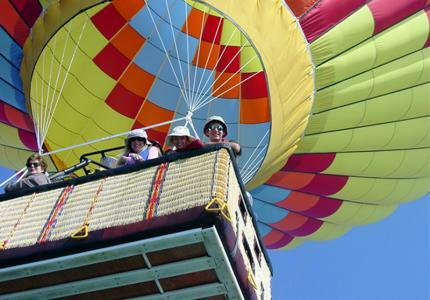 Soar with the birds above the mountains in a tandem hang glider and Thermal Sky Sports. This ultimate rush offered by takes off from the Mount Rose summit and lands in Washoe Valley, about 8,000 feet below. Your tandem guide will fly you above the mountains and valley for about 15-25 minutes and may even let you take over the controls. You will need to run off the side of the mountain, so good physical health is needed to enjoy this thrilling sport. Hot Tip: You can pay a bit extra to have Thermal Sky Sports take photos or video of your glide. Being in the Sierra Nevada, Lake Tahoe is one of the world's best mountain biking areas. The views from the famous Flume Trail alone are enough to get you onto a mountain bike. There are dozens of trails for all levels and the friendly people at Flume Trail Rentals will outfit you for these trails. For around $60 a day you can get all the gear (bike, helmets, pads) and shuttle rides to and from the Flume Trail on the East side of the lake. Hot Tip: The Northstar California resort near Truckee has a bike/hike park with cross country and downhill mountain bike trails. 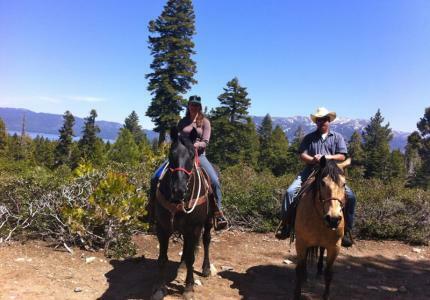 Lake Tahoe Adventures offers all terrain vehicle rentals and tours on the Rubicon Trail and the surrounding wilderness. The company offers tours all year long and you have your choice of an ATV, Buggy or the open air Razor. Each of these vehicles will take you onto the backroads of the mountains where you can get 360 degree views of this high desert. The company also offers custom tours for larger groups. Tours are about two hours and start at around $120. Hot Tip: You can also book tours in the Pine Nut Mountains near Virginia City with the Nevada Adventure Company. Kayaking on Lake Tahoe is a relatively safe activity so go forth with confidence you'll return with minimal injuries. This is not a white water Class IV, and you'll have a life jacket on... Great thing about Kayaks is that you can launch them just about anywhere, they handle all kinds of water conditions, go anywhere and see the sights while getting some exercise in. Hot Tip: There are several kayak rental companies around Lake Tahoe and we'll give a good starting point here with Tahoe Kayak Rentals.